So who would you tell you are able to talk to dead people? The correct answer is nobody! Tell your story and they will lock you up in a padded room in a New York minute! After more than seven years of these experiences (Steve thought he was a functioning schizophrenic) he decided to tell someone. After seeing the Medium John Edward on TV late one night, he took a VHS tape of the show to dinner with the woman who is now his wife. He confided to her that he was able to see and hear dead people. She told him that this ability is a gift. And then his study and training as a medium began. After that night, his life has been an unbelievable and exciting roller coaster ride. This book is the true story of the near-death awakening of a skeptical, non-religious, West Texas cowboy. You’ll learn more about the accident that awakened him to the metaphysical world and a new life as an evidential medium. As he talks to your family and friends in heaven, Steve gives closure, peace and new beginnings to the people who seek him out for personal readings. In this book, he’ll share some of the amazing stories he receives from people who get a reading and then write back to confirm or validate what he shares from their loved ones. Steve believes that there is no chance, no coincidences and everybody is born psychic. 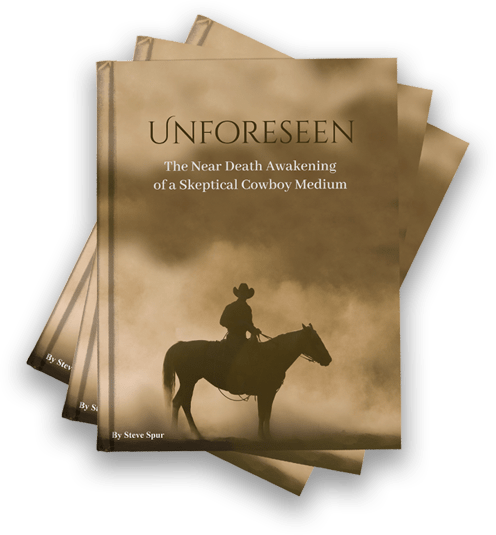 Unforeseen is a tell-it-like-it-is book of the process a skeptic went through to awaken to a spiritual world and develop wisdom, compassion and love on his way to becoming a cowboy psychic. Steve writes about what it’s like in the spirit world. He also gives information about what people can expect who would like to walk a spiritual path. He’ll prove to you that there is a heaven and that there is nothing to be afraid of on the other side. If you’re ready to take the journey and find out why you were really put here on this earth, saddle up! Steve will share how you can take the ride of your life!